Kamadeva is the Hindu Deity of love. Kama Deva literally means 'divine love' or 'god of love'. He is normally depicted as a young and handsome winged man who wields a bow and arrows. 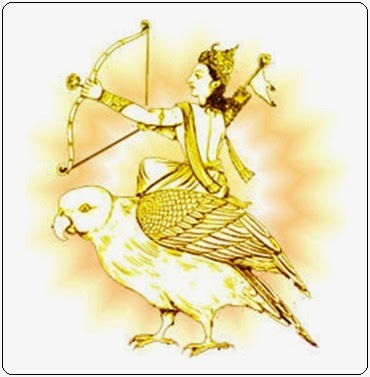 Kamdev is known by several names like Ragavrinta, Ananga, Kandarpa, Manmatha, Manasija, Madana, Ratikanta, Pushpavan, Pushpadhanva or simply Kama. The story of the birth of Kamadeva is told differently in several Puranas. In some stories Kamadeva is said to be the son of Goddess Mahalakshmi and in others he is said to be the mind born son of Lord Brahma. He is also the husband of Rati the Goddess of Beauty and is also said to be an incarnation of Pradyumna, a son of Krishna by Rukmini. The vaishnavites believe that he is Krishna himself. The basis of the story is that after Kamadeva was burned to ashes by Shiva because of his anger the cupid god merged into the body of Vasudeva Krishna and in order to get his body again he was placed in the womb of Rukmini. In this mantra KLEEM is the Kama bija. Om can be used instead of kleem as well. Chanting 1 mala of this Mantra facing West on a 108 beads Rosary for a 40 day period can bring in love and affection to the chanter as it increases the positive energies from the 7th house which is related to desires, marriage and relationships. If you have been searching for the right love or life partner in vain or your sexual life has gone stale then chanting Kamadeva Gayathri Mantra can help. The most auspicious time to start chanting this mantra would be on Pradosh kaal preferably from Basant Panchami till Holi. Wearing the 13 mukhi Rudraksha Bead representing God Cupid is also very effective in attracting love.